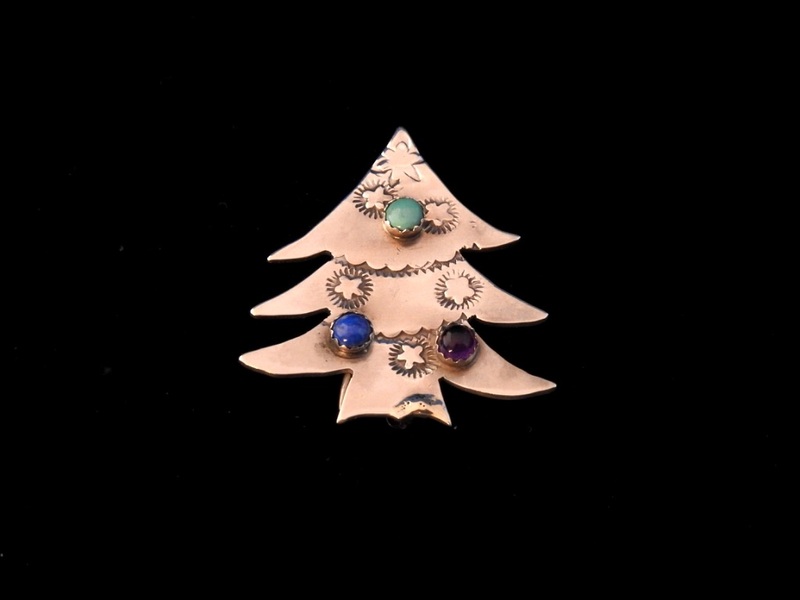 “Star-Spangled Spruce” Tree Pin. $325. SOLD. A star-spangled spruce stands firmly rooted in the blue glow of a winter’s night. Wings coaxes tree, stars, and shades of a winter’s dusk into showing themselves with this small shimmering pin. The tree is cut freehand of sterling silver, with dancing boughs and a scalloped trunk. Radiant five-pointed stars, hand-stamped, spangle the branches, all garlanded with the faint light of a sun setting beneath the stormclouds. At the top, a brilliant six-pointed star points in all directions, while the spruce itself shows through in the blues of the night by way of three bezel-set cabochons, one blue turquoise, one lapis lazuli, and one the deep purple of amethyst. Tree stands 1-1/2″ high by 1-3/8″ across at the widest point; cabochons are 1/8″ across (dimensions approximate). Posted on Sunday, December 16th, 2018 at 7:03 pm. Filed under: Pins	RSS 2.0 feed.